A cover shot of “International Seafood” years ago. 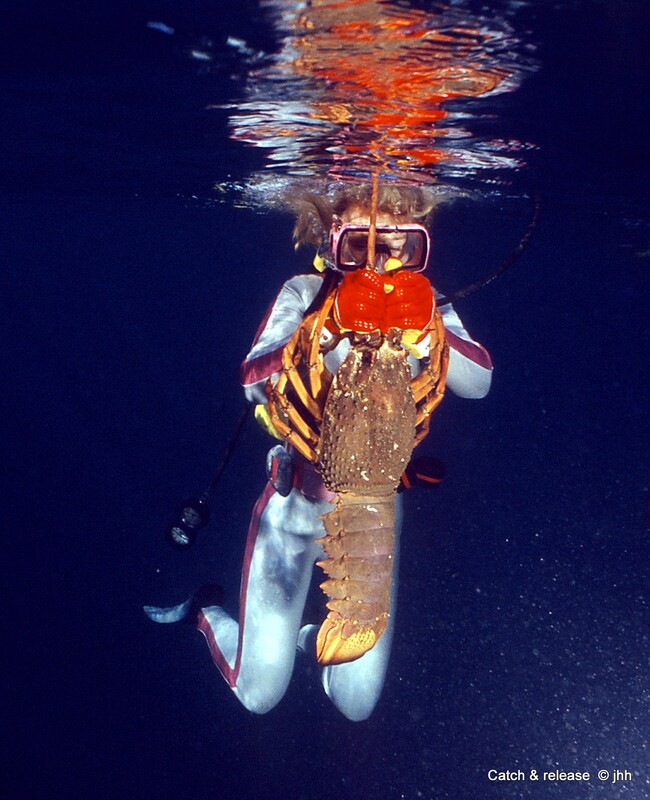 (Above) ‘Eastern Rock lobster in natural habitat’, picture by JH Harding (Public domain – free use with credit given to source). Luderick are often netted in large quantities – which then devalues them at the fish market, so they become lobster biat when salted and dried. 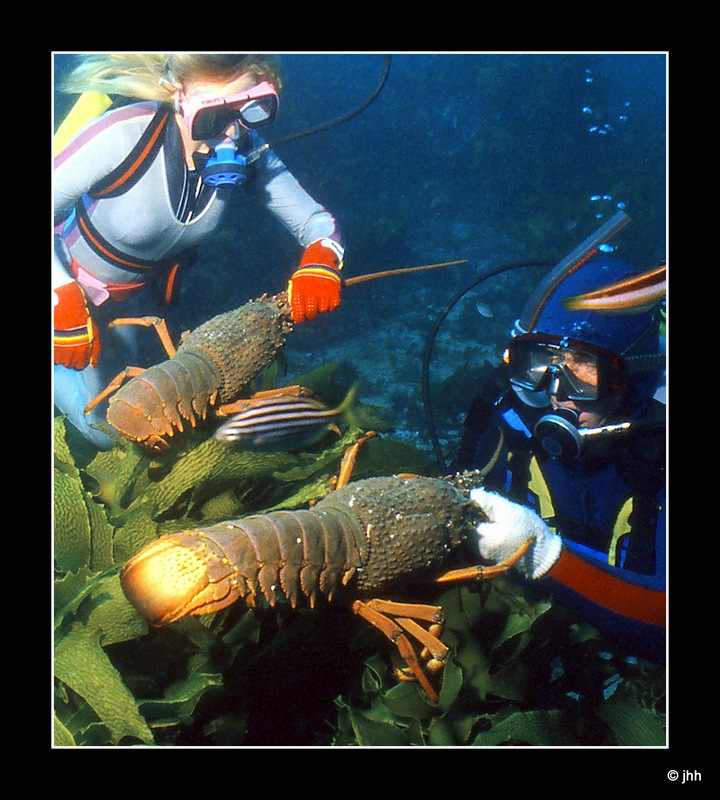 Rock lobster of this size are not permitted to be taken because they are breeding stock. It took decades for the fisheries department to figure out what professionals always knew was correct, but the theory had to be proven on paper. Scientists have been reluctant to converse with fishermen in the past but that shortcoming has improved with a better media. Cooking the catch in the era before plastic tags were required on each lobster, pro fisherman Joesph Bloe cooks his catch in the era before tags were law to limit poaching of the catch. 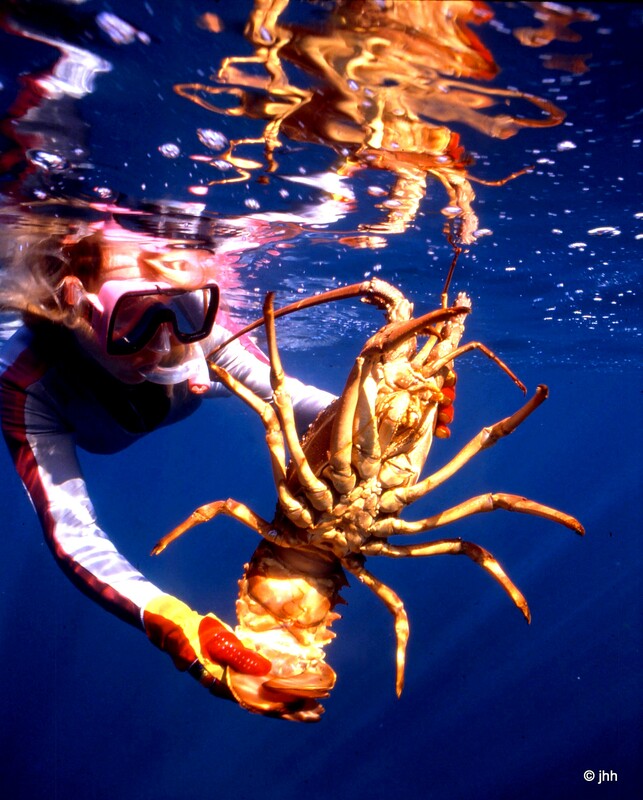 Eastern Rock Lobster is the variety common to New South Wales waters. My opinion is they are more tasty than Victorian or Queensland lobsters. The best and also the less in number being caught. We knew them as ‘crayfish’ in the 1960s. (Above ‘cooking lobsters’ picture is hereby now in the ‘free-use public domain’ world wide providing credit is given to the source). Large lobster cannot be sold or taken. Often these are kept as ‘callers’ (live prisoners) in the hope, belief, strategy they will attract smaller and legal-sized companions into the same trap. These lobsters (pictured under a boat offshore)were being kept until the next season, with food and in deep water. The plan failed disastrously weeks later when the buoy line came adrift or was cut by a passing ship and the entire trap and these contents lost. (Details by Brian Davies RIP).